Answers to your questions about Fluency School. Is Fluency School the Right fit for you? Get honest answers to common questions. I believe you should feel 100% confident in your choice to join Fluency School. Get answers to questions about cost, payment options, what level you need, our risk-free guarantee, and more. When is the next Fluency School course? Currently, Fluency School is offered 3 times per year. The July course is June 29 – July 27. Be sure to join the Fluency School Waiting List so you’ll be the first to know and get important updates about the July course. Will this program really help me become more fluent? I’ve tried other classes before. How is Fluency School different? 1. You get speaking practice. Have you ever taken an English class and at the end, you said, “That was TOO MUCH speaking. I wish there was less speaking practice.” Probably not. Most English online courses only provide videos and worksheets, but you don’t get to speak. Many classes in schools have a large group of students, so your speaking time is limited. In Fluency School you get small group discussions 5 days per week and you get personal speaking activities. This means you get hours and hours of speaking practice. Most students get an average of 25 hours of small group speaking practice. 2. Personal attention and in-depth feedback. With each of your speaking activities, you’ll receive in-depth feedback, corrections, and suggestions for improvement from me on a private document that only you and I can see. I care about your success and will be there with you at each step. 3. An expert English trainer. There are thousands and thousands of English teachers all over the world. And many of them are good. However, not all of them are. Some are inexperienced. Others have very little training. However, with Fluency School you’ll work with a teacher who has a masters degree in TESOL (Teaching English to Speakers of Others Languages) and 20 years of experience working with hundreds of adults all over the world. In the small group discussions, you’ll have the opportunity to communicate with your teacher and other professionals from all over the world. You’ll boost your listening skills and your ability to understand different accents. 5. A permanent support community. Even after Fluency School, you’ll continue to be a part of my permanent private community to get ongoing support, encouragement, and motivation. 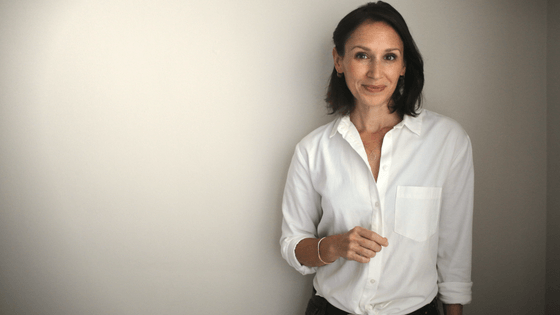 As the founder of Fluency School, I care about your success. Fluency does take work and this course was designed with great attention, energy, and results-oriented tasks. I want you to succeed. That does mean you’ll have to be committed, do the work, and stay focused. But I will be there with you every step of the way. You can also find out what previous Fluency School students have to say about their experience. What do I really get with the Fluency School program? What will I learn? Fluency School was designed to give you exactly what you need: practice and support so you can feel natural when you speak English. You’ll also become a part of an international community that supports and motivates each other. And much more. You can get the full course plan on the Fluency School Course Details page. Three days per week you’ll have the opportunity to participate in small group discussions for spontaneous conversation practice. The discussions will focus on the module topic of the week but will be different from the speaking tasks. Every week you will have 3 speaking tasks related to the topics in the module. For each of your speaking tasks, you’ll receive personal feedback, corrections, and advice from your English teacher and from others in the course. There is a total of four modules. Every week you’ll watch training videos will give you the information you need to prepare for your speaking tasks. You’ll learn advanced grammar and vocabulary plus tips to help you use them when you speak. You can watch these videos online in the course or you can download them to watch from your laptop, tablet, or smart phone. What do I need to join Fluency School? You need just 3 simple things to join Fluency School. First, you need to register for the course. Be sure to join the Fluency School Waiting List so you’ll be the first to know when registration opens. Second, you need Internet access. You can use a computer, laptop, tablet, or smart phone, but you’ll need access to the Internet. And finally, you need a microphone to join the small group discussions. If you’d like to participate with video, then you’ll need a camera on your computer, tablet, or phone. It is recommended that you are on Facebook to get the most benefit from the course, but it is not necessary. How will I access all these materials and the small group discussions? Everything is designed to be simple, clear, and effective. I want you to learn how you learn best. For the small group discussions, we use a software called Zoom, which is absolutely FREE for you to use. Zoom is similar to Skype so we can communicate with audio and video, but it has many more features and it has a much stronger connection than Skype, which is perfect for an international community. You will have a link to my online classroom. When you’re ready to join a class, you can click the link and immediately join. This means you can do what works best for you in your situation. Some people love to do everything on their computer or smart phone. Others prefer to print the materials and download the videos to keep them. Your speaking tasks will be completed on your own time. You’ll complete your speaking tasks by audio or video and share them with your teacher for evaluation and feedback. Speaking activities and feedback are 100% private. Who is Fluency School for? If you want to learn how to use smart, effective strategies to increase your English fluency, continue your progress even after Fluency School, and use English for your success, Fluency School is for you. Whether you use English in your career now or you’re waiting for your dream job, if your future success requires English then Fluency School will help you develop the skills you need to communicate naturally and effectively in English. If you’ve recently moved to an English-speaking country, but you’re struggling to find your place… it’s difficult to make friends, feel comfortable in the community, speak with your children’s teachers, find a job, and to understand native speakers, Fluency School will help you feel more at ease in speaking English and participating in conversations with native speakers. If you’re an English language teacher in your community and you’d like to have more career or teaching opportunities, to deepen your knowledge and skills for your students, or accelerate your own speaking abilities in English, Fluency School is a perfect fit. Curious what others say about Fluency School? Get honest reviews & listen to interviews about the course. Do I have the right level for Fluency School? Good news! If you are reading these questions and answers – and you understand them – then Fluency School is just right for you. Fluency School was specifically designed for international English language users with an intermediate level of English or above. At this level, you already have a strong foundation in English grammar and vocabulary, but what you need is to learn to speak English naturally and fluently. I know you’ve been learning English for years. And you feel stuck. Getting unstuck is exactly what Fluency School will help you do. Fluency School is the only online fluency course that includes speaking tasks with feedback from a native English trainer, small group discussions, video training, and personalized training exercises. Do I have the Right Level for Fluency School? Self-Assessment. I created this self-assessment so you can quickly identify if you have the right level. Simple click on the document and complete the assessment. It will take 5 minutes. Can deal with most situations likely to arise while traveling in an area where the language is spoken. Can enter unprepared into conversation on topics that are familiar, of personal interest or pertinent to everyday life (e.g. family, hobbies, work, travel and current events). Can connect phrases in a simple way in order to describe experiences and events, my dreams, hopes, and ambitions. Can briefly give reasons and explanations for opinions and plans. Can narrate a story or relate the plot of a book or film and describe my reactions. If that description is correct for you, then Fluency School is a perfect fit. You can read a complete description of a B1 level here. NOTE: If you are beginner English speaker or at a level lower than intermediate, Fluency School is not the right fit for you. What if my English level is higher than an intermediate level? Do you still feel too shy, too nervous, or too afraid to speak in English? If you answered yes, then Fluency School will help you overcome those feelings and is perfect for your level. This is the perfect opportunity for you to get the practice you really need. You’ll be with other motivated professionals from around the world who want to accomplish the same goal and you’ll have the support of your English trainer. Everyone in the class will get personalized feedback (encouragement, corrections, and advice) in the speaking tasks. This means that at your level – even if it’s different from others – you will make progress. 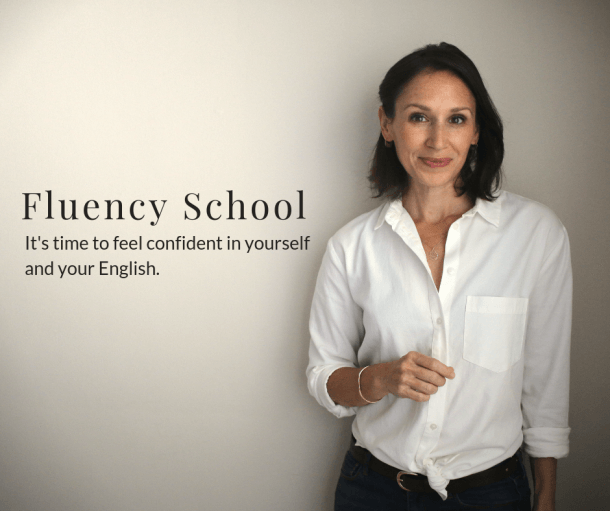 Fluency School is designed to help you exactly where you’re at in the language so you can improve, feel natural, and be confident when you speak. How long will I have access to the course website and materials? With your unique username and password, you will be able to access the Fluency School course for 60 days. That means that even when the course is over, you can still access the videos, personal training activities, and discussions. Your unique username and password will allow you 60 days of access to the website. After 60 days, you will no longer be able to access the course website as Fluency School will be preparing for the next course. ⚡️👉But you have permanent, lifetime access to the Fluency School Resource Library and to the private community online. Will I work with others in the class or only with my English teacher? You have the benefit of speaking with other students, teachers, mentors, and Annemarie. Again, the goal is for you to learn as you learn best. With Fluency School Team, you have the great benefit of working with your native English teachers and an international community. In Fluency School, you will meet others from all over the world. This means you’ll get to know other professionals, learn about new cultures, and develop your listening skills to understand different accents and ways of speaking. How many students are in the small groups? On average, our small groups usually have 5-6 students in the class. It’s possible that some classes will have 1 student more or less, depending on the popularity of the class time. Does Fluency School work for everyone? First, Fluency School is not for a beginner or low-intermediate student. If a student’s level is too low for the course, the student will be asked to join the course at a later date. Secondly, Fluency School and fluency, in general, is hard work. It takes time and commitment from each student. For the students who do the work, who commit time, who follow the process, and participate in the small group classes, Fluency School works 100% of the time. I see it in every class. But for students who don’t want to commit, who don’t do the tasks, who don’t take time, they make less progress. I’m very honest about this in the course. I tell each student I’m 100% committed to their success. And I am. I am there every step of the way. But each student must also be committed. They must be willing to accept challenges and do the work. The good news is, Fluency School is also fun. We spend a lot of time laughing and every group becomes very close. It is hard work but it’s also fun work. If you’re ready for a class and a teacher who are committed to you AND you’re ready to give your time and energy, then Fluency School will work for you. Do you only work with women? Can only women join Fluency School? At Speak Confident English, we love to help women succeed. Our mission is to inspire, educate, and coach international women on how to build the courage and confidence they need to be successful in English—for work and daily life. In our courses, we have male and female students but 90% of our clients are women. When are the small group discussions? Is there a time that will work for me? In Fluency School, we have students join us from all over the world and from every time zone. We have small group discussion classes available at multiple times during the week. You can select the dates and times that work best for you. Here is the small class schedule for April 2019. Please be sure to select your time zone to view the correct times. We record all of our small group classes, so if you miss a class because of travel, work, feeling ill or any other reason, you can always watch one of the recorded classes. If I travel, can I stop the course and start again later? No, it isn’t possible to stop in the middle of the course and start a different course later. If you plan to register, we recommend that you review the Small Group Class Calendar to make sure you’ll be able to complete Fluency School when you join. If you have a lot of travel to do during the month and if you think you’ll miss a lot of classes, we recommend joining a later course. How much does Fluency School cost? The total value of the course is $1,515. Your investment for the July Fluency School course is $799 USD when you make one full payment. 15 live small group classes. Value: $525. Included in registration. Personal, private feedback. Value: $400. Included in registration. Advanced fluency training. Value: $250. Included in registration. Private Resource Library. Value: $150. Included in registration. Surprise Final Bonus. Value: $100. Included in registration. All of this is included in your payment of $799. Is there another payment option? Payment for Fluency School is flexible so you can do what is best for you. There are two payment options for Fluency School. 1. You can make one full payment of $799 USD. 2. You can make 2 monthly payments of $450 USD (for a total payment of $900 USD). You will make the first payment when you register for the course. The second will automatically be paid 30 days later. For example, if you register for Fluency School on March 18, 2019, you will make a payment of $450 USD. Then, on April 18, your debit or credit card will automatically be charged the second payment of $450 USD. You can make a payment with a debit or credit card such as Visa or Master Card. Or you can choose to make a payment through PayPal. Speak Confident English does not accept checks or wire transfers. What if I’m not happy with the program? Do you offer a guarantee? Absolutely! You can even try the first week 100% risk-free. I’m fully committed to helping you speak English proficiently and with confidence. And I want you to be absolutely satisfied. You can try the course for 1 week with the opportunity to get a full refund. If you do the work and feel that the course is not for you, you will receive a 100% refund. In order to get a refund, you must do all the work and tasks in Week 1. This means you really need to commit to Fluency School for the first week. I know if you do the work and participate in the course, you will get the results you need. However, if you do the work and do not find value, you can simply send me all the work you’ve completed throughout Week 1 with your request and I will provide you the full 100% refund. I do this because I seek serious, committed students who are ready to do the work. I take the course seriously and have a very high standard of commitment, support, engagement and results-oriented learning. When you register for Fluency School, you agree to this refund policy. How long does Fluency School take? I'm not sure I have enough time. You’re busy. And that’s okay. The short answer is, we recommend 5-6 hours per week to make the most progress. The good news is Fluency School can fit into any schedule. The online course is flexible, which means you can do as much as you want each week. Even if you’re planning a vacation or balancing work and family life, Fluency School can work for you. Most students who join Fluency School have a full-time job and a family to care for. But they can complete the course successfully. With easy to follow videos, step-by-step worksheets, and flexible speaking practice opportunities, you can fit Fluency School into the schedule that works for you. Every week you’ll receive new speaking tasks and have opportunities for spontaneous conversation in small group discussions. With all speaking opportunities, you’ll receive feedback and support so you can make progress. You can complete the speaking tasks on your own time when you want. Multiple small group discussions will be offered so you can choose a date and time that works for you. The speaking activities are supported with in-depth training videos and Personal Training Exercises. You can watch the videos and complete the personalized training materials anytime you want. Training videos are 6-12 minutes long so that you can watch them easily when you have time. You can watch one each day or watch them all at one time. Speaking tasks, small group discussions, video training and training exercises give you the perfect combination to make progress in your English so you can feel natural and speak like a professional. If you do your work, contribute every week and participate in the small group discussions, you can estimate 5-6 hours of work per week. If you are very active in the community and with the speaking tasks, it may take more of your time but this is your choice. Many students have a lot of fun in Fluency School and enjoy being active. However, if you want to take your time, if you just want to do a couple of videos a week and do the exercises on your own time, you have that option. You can download all the videos and training sheets to do at any time. However, you may not make the same progress or have the same results. If you are unable to join a small group discussion, don’t worry! You can still participate in the course. Plus, all small group discussions will be recorded, so if you want to listen to one later, you can at any time. I'd prefer to do this course alone. Can I get the whole Fluency School program instantly and do it when I want? One reason Fluency School is so successful is the small group community. It isn’t possible to get the whole Fluency School course instantly. One of the greatest benefits in Fluency School is the community and their support. Each of you will do the same tasks week-by-week. You will learn and grow together. And you’ll support each other. Every week, you’ll receive access to the next Module of Fluency School. Each participant in the class will do the weekly modules together so you can learn, grow, and support each other. The Fluency School course was carefully designed so that each week builds on the previous week. This means you will use the skills you learn in Week 1 in the following weeks. This is exactly what will help you learn to feel natural and speak like a professional in English! This course is 100% online. I've never taken an online course. I’m not sure I’m comfortable with it. You’re not alone. Most Fluency School students have never taken an online course before. And the good news is, I’m here to make sure you understand every step and how the online course works. I understand it can feel scary to do everything online but the good news is, the course is created in a very simple, easy-to-use way. After you purchase Fluency School, I’m happy to work with you to make sure you know exactly how to use the course. I also have an assistant working with me to provide more support and to answer any questions you might have. What if I don’t feel ready? Can I take Fluency School another time? If you’d like to join Fluency School, then your time is now! Life will always be busy. Maybe you are waiting until you can speak English perfectly or until you’re ready. You might always feel doubt. But if you really don’t feel ready, then Fluency School is offered 3 times per year but classes are small and fill up quickly. The registration cost for Fluency School is subject to change. If possible, I encourage you not to wait.